Uncharted is a franchise that has been around now for a whole decade, becoming one of the biggest gaming behemoths during the PlayStation 3 generation. It was a franchise that propelled Naughty Dog to new heights, moving them from a developer that just made great 3D platformers to being considered one of the top-tier developers in gaming. Last years Uncharted 4: A Thief's End wrapped up the story of the quirky fortune hunter Nathan Drake, giving him and his band of lovable characters Victor Sullivan and Elena Fisher the sendoff they deserved in the most fan-serviceable way possible. As an Uncharted fan ever since the second entry, it was a sad moment to see one of my most beloved franchises come to an end. However, Naughty Dog at that time had announced plans for a 'single-player expansion' for fans to still be excited for. One year on and we now have Uncharted: The Lost Legacy - a brand new, lengthy standalone Uncharted adventure. 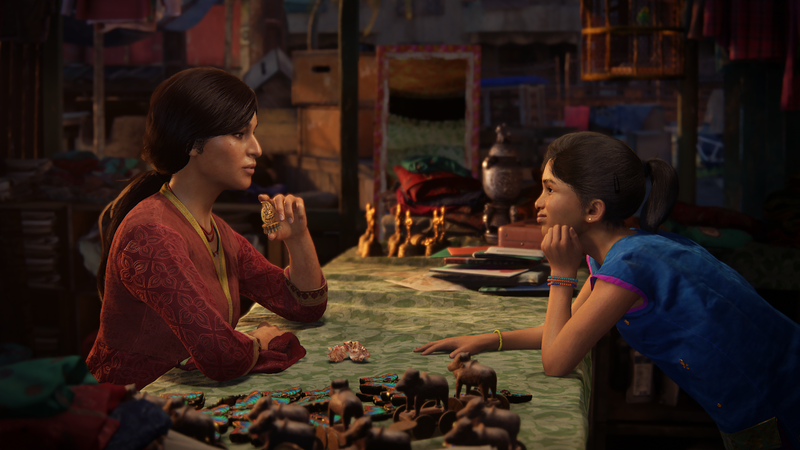 The Lost Legacy takes place one year after Uncharted 4 wraps up, following fan-favourite Chloe Frazer on an adventure to uncover the fabled 'Ganesh's Tusk' - an ancient Indian artifact her father dedicated his life trying to find. Chloe is joined by former mercenary Nadine Ross, one of Uncharted 4's side villains, who has since lost her Militia company 'Shoreline' and is in desperate search for money in order to buy back her company. In their search the duo are also competing against Indian rebels lead by their leader Asav - a former doctor turned treasure hunting mercenary. Asav is an intelligent but calm and calculated villain, driven by his own motivations to find the Tusk. The biggest issue with Asav was his lack of screen time, which as said in dialogue, he is a man who steps once all the hard work is done. While that narratively make sense, I would have preferred to have seen more of him, as he was a villain I found was interesting but felt severely underdeveloped. 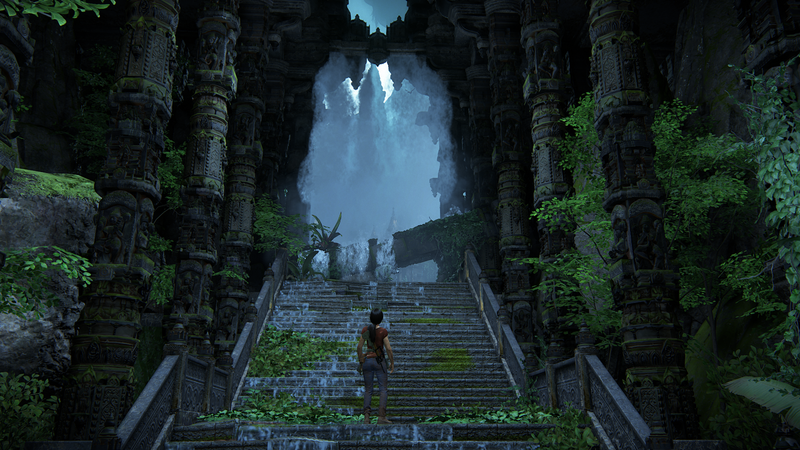 The game takes place entirely in India, aside from the beginning section starting in small city, the remainder of the game is set throughout a massive Indian jungle, making the game feel more coherent than previous Uncharted games that would be constantly jumping from one part of the globe to the other. 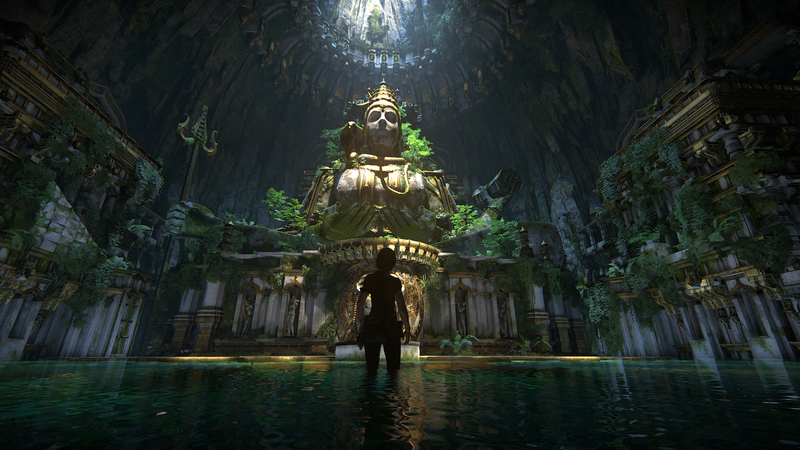 It also brings back that vibe the original Uncharted had, as it was all set in one location from start to finish. The Lost Legacy contains the typical action set pieces you come to expect from an Uncharted game, including one of the greatest set pieces in an Uncharted game ever at the end of the game. A bunch of the set pieces I felt were culminations of ones from previous games, a sort of 'Greatest Hits' collection of set pieces if you will, all the while still feeling great and super intense to play, bringing back an Uncharted 2 feeling. 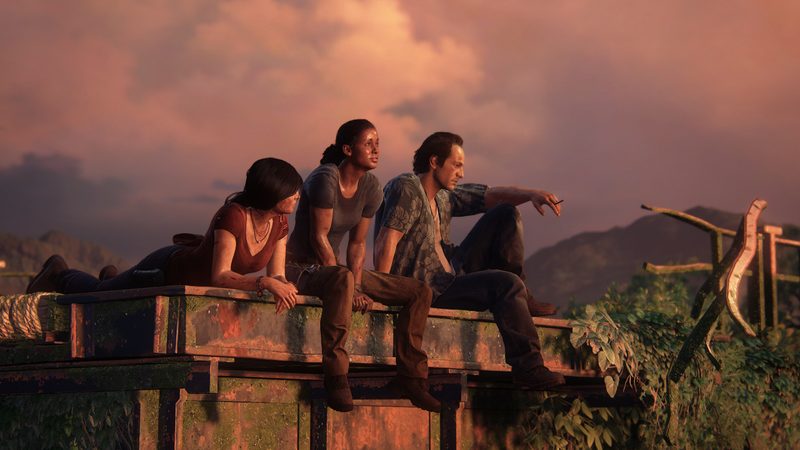 Naughty Dog are known for pushing the most out of their games graphically, and The Lost Legacy is no exception. Uncharted 4 has been regarded as one of the best looking PlayStation 4 games on the market, up beside games such as DriveClub, Ratchet & Clank, The Order 1886 and this years Horizon Zero Dawn, however I feel Lost Legacy has one upped Uncharted 4 graphically. Jungle environments are lush with tons of detail, filled in with incredibly vibrant colour palette and tons of mountains covered in clouds far into the distance. Keep in mind I played The Lost Legacy on a standard PS4 on a 1080p screen, so I can only imagine how beautiful the game must look on a PS4 Pro with a 4K HDR screen. The Lost Legacy's gameplay plays identically to Uncharted 4's, as the game was originally designed to be a DLC expansion before becoming its own standalone game, so Chloe plays and has similar animations to Nathan Drake though feeling slightly less weighty to control. Climbing, movement and partner takedowns all feel just as smooth as they did in Uncharted 4, with refinements they've taken away from Uncharted 4 feedback. One element they've definitely taken from feedback is Stealth, something that I felt more inclined to do when approaching enemies in Lost Legacy than I ever did in Uncharted 4. The addition of a Silenced Pistol definitely makes stealth a better option, making it easier to eliminate enemies compared to needing to take them down with your fists while risking getting spotted. 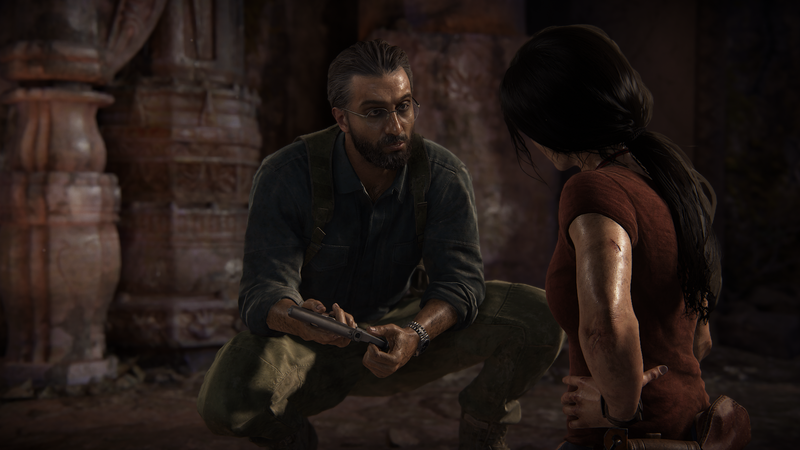 While Lost Legacy takes several mechanics from Uncharted 4, such as the rope swinging and sliding, a new mechanic Naughty Dog added is lockpicking. Its very simplified and not on the level of games like Fallout or The Elder Scrolls, where you just move the radial to a vibrating section and will automatically pick it. The Western Ghats chapter is the largest playable area in an Uncharted game ever, filled with multiple main and side objectives for Chloe to undertake - each designed with multiple paths leading to them and puzzles to do. 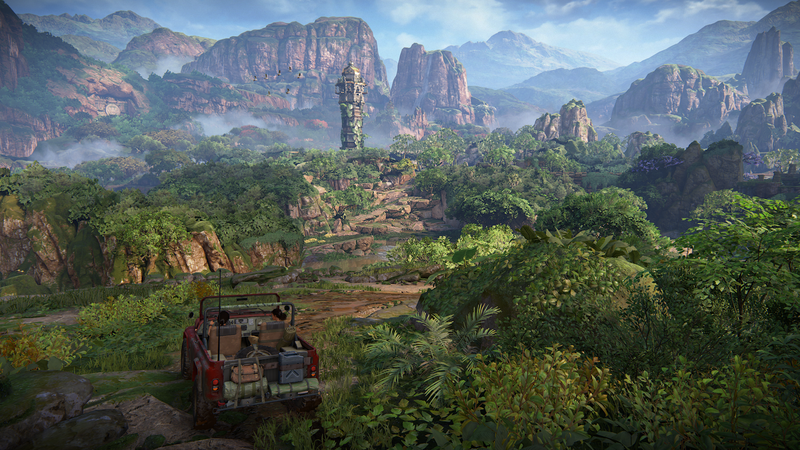 The area is far too large to complete on foot, bringing the return of the Jeep from Uncharted 4. As expected, the jeep plays identically to the one from Uncharted 4 - with the same winch mechanic being used to break down doors in certain areas. The Western Ghats is something comparable to Metal Gear Solid V: The Phantom Pain in terms of map and mission layout, allowing you to tackle each of these objectives in whatever order you wish. Various enemy camps, ruins, caves and small settlements are sprawled around for Chloe and Nadine to visit, containing hidden treasures and a new type of collectible - Hoysala Tokens. Hoysala Tokens are a Western Ghats specific collectible scattered around in hidden areas, with some hiding behind breakable walls and others requiring puzzles to be completed. Collecting all tokens around Western Ghats unlocks a ruby bracelet for Chloe, which radiates when shes close to nearby treasures. The Lightbar on the controller changes colour depending how close your are, as a sort of hot and cold game, which arguably is one the greatest additions Naughty Dog have added into an Uncharted game, especially for trophy hunters searching for all the treasures. 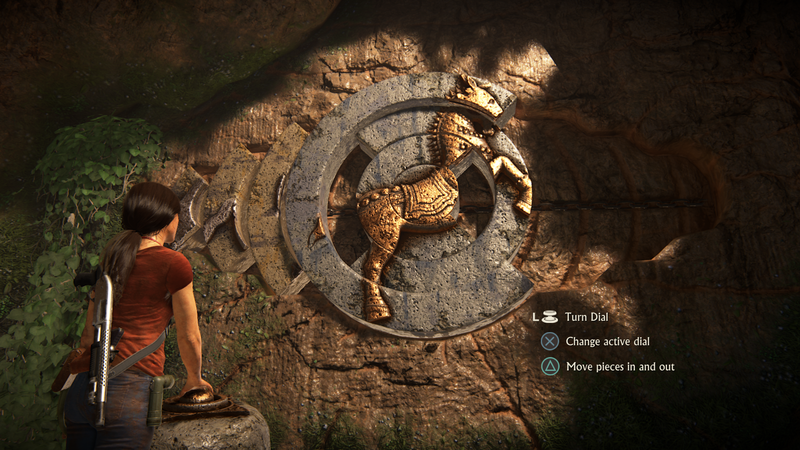 As well as Hoysala Tokens, theres a bunch of new collectibles including 'Photo Opportunities'. 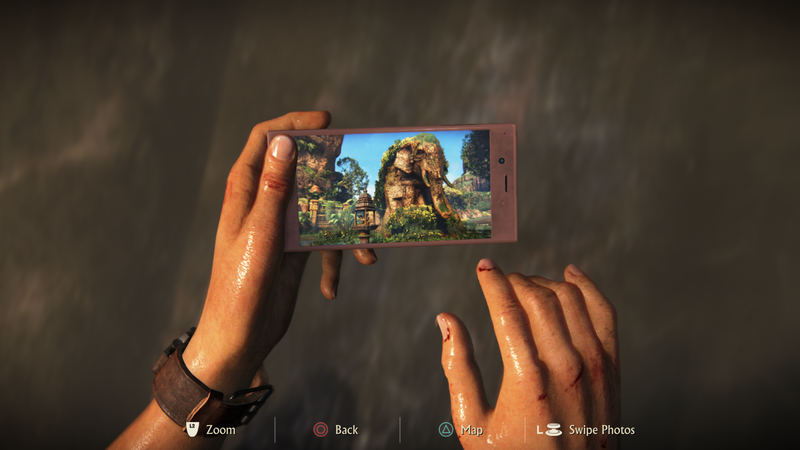 This is how Chloe documents her findings, by taking photos on her smartphone, similar to how Nathan Drake had his journal in Uncharted 4. Another are 'Lockboxes', which are scattered throughout the world to unlock, containing special weapons for Chloe to use. New weapons are also in the game, including various from Uncharted 2 such as the FAL, Desert 5, Raffica and Micro 9mm - a great throwback with it being the game Chloe was first introduced. Dialogue stands out as the top-notch Naughty Dog type you come to expect. Claudia Black (Chloe) and Laura Bailey (Nadine) and Troy Baker (Sam Drake) deliver excellent performances, with them arguing and bantering between each other during certain adventuring segments reminding you it is in fact an Uncharted game, and light-hearted moments developing their relationship throughout the game. Conversations between the two in The Western Ghats would continue if abruptly interrupted, something Uncharted 4 introduced but nonetheless great for those keen on hearing their dialogue and thinking they've lost their chance to hear it. Chloe and Nadine's dialogue had continued references to Nathan Drake and other characters in the Uncharted universe which were a great nod to Nathan Drake legacy. The performances between the two characters reminded me of why I loved Chloe as a character back in Uncharted 2 and 3, and gave justice to Nadine who I felt was such an underrated character from Uncharted 4. Enemy dialogue is dynamic, with enemies communicating back and forth with one another, making them feel like real humans rather than scripted NPCs. An interesting section I noticed towards the end of the game included references to Uncharted 4 between two random enemies, another small detail easily missable but another nod to the fans who are paying attention and remember the events of Uncharted 4. Enemies will constantly react to your actions in the world, whether it be shooting a pistol and hearing you've run out of ammo, or discovering one of their friends dead bodies you've left out in the open, they work as a team in order to try find you. Sound has always been high quality in Naughty Dog games, with tons of audio options and presets which can be customized to your liking based on your set up. Gunfire crackles through the air, blades of tall grass rustle in the wind, accompanied by the sounds of native Indian birds chirping in the foreground and brutal punches as the hit their target smack in the jaw. Henry Jackman returns to compose the score for Lost Legacy, perfectly capturing the India vibe and theme with Indian instruments, and ramping up the intensity as you're being shot at while trying to escape a night lit rooftop. However, various songs were reused from Uncharted 4's score. 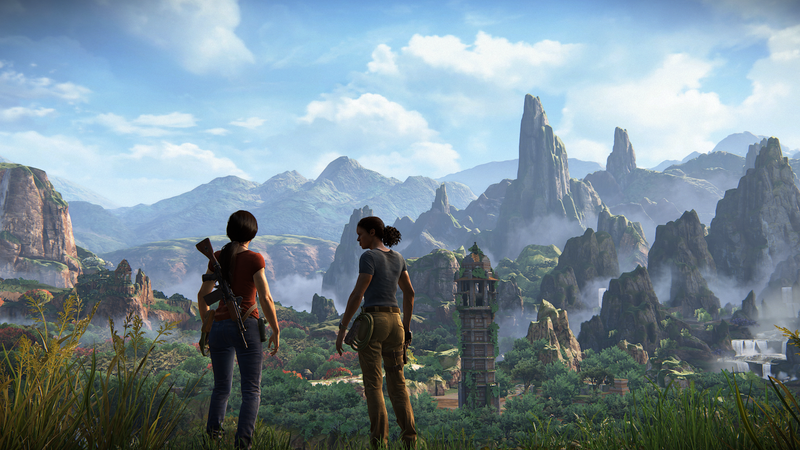 While they were great to hear, as some of my favourite music from an Uncharted game came from Uncharted 4, it just shows how little time Naughty Dog had to make The Lost Legacy. 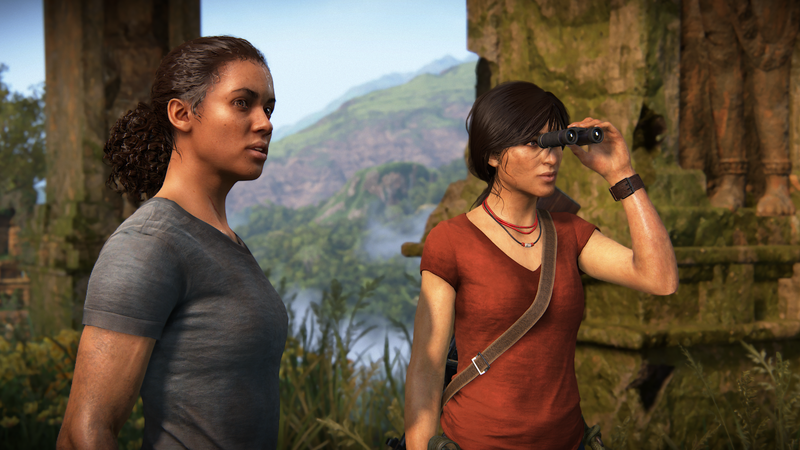 Uncharted The Lost Legacy is the first, full-length Uncharted game we've had that doesn't feature Nathan Drake, and while many may be skeptical of this, The Lost Legacy proves that Uncharted can continue without Nathan Drake. While being not a very long game, as the game was produced in little over a year (with a ton of additional outsourcing), it's nowhere near as short as you'd expect. In terms of length, you're looking at a solid 8-9 hour experience which offers plenty to find and explore, as well as Uncharted 4's multiplayer being included in the package - you get a full length Uncharted game for the price you pay. The Western Ghats chapter is one of the most interesting aspects of the game, with many considering it an open-world Uncharted game. The game is still a very linear experience, with The Western Ghats being the only section of the game adopting this hugely open style. I wish more sections of the game had an area like this, however due to being developed in such a short time, The Western Ghats is still one of the most memorable section of the game besides the final set piece. Its clear to see Naughty Dog go in a direction of more open-level design, with them originally experimenting with it in The Last of Us and now achieving a semi-open world with Uncharted Lost Legacy, which will only go bigger and further with The Last of Us Part II.